As the end of 2016 is drawing near, many businesses are using this opportunity to plan for the upcoming year. You probably would like to pause for some time, look back on what you’ve done so far, and imagine what 2017 would be like. Definitely, recruitment trends should be a top concern. However, since there’s already too much going on with data integration, social media recruitment, talent sourcing, training programs, content marketing, recruitment technology use, and a seemingly never-ending list on your agenda, which ones should you pick up and drop? At any given day, you will find about 70% of business leaders and decision makers who don’t exactly know how to measure ROI or are not seeing any evidence of ROI in their projects. That’s largely because they’re focusing on the money side of ROI. Time – Time is a priceless commodity that should be used well. To help you measure your ROI in terms of the time factor, you could track the period you spend on a specific task such as talent sourcing. If you see unnecessary processes along the way, scrap them. You’d be surprised to find how much you saved by not wasting time on things that don’t matter. Content – Your blog is one of your most precious sources of content. So, stop creating unnecessary content. Further, thinking whether content is available online is out of the question. Just imagine the bytes of data that are posted online every minute in hundreds of platforms, when in fact, it’s the lack of relevant content that’s the problem. In the same league is your CRM or ATS database. To maximize it, you might want to choose a content strategy over a content plan, which basically means having loads of data will not guarantee you’ll be enjoying ROI. The key is to use innovative strategies in handling your data. As recruiters, you should be aiming for better quality conversations with your candidates when you call them like asking them, for example, about what they think of Facebook’s policy on fake news. This will help you gauge their insights in a more different way than your usual assessment questions. Perhaps for 2017, you want to introduce some changes in your organization. It might be about how to run your system better, training your recruiters , or an IT project. Since change can be overwhelming, given that you’ll be stepping into an unknown or unfamiliar territory, you’ll need to have a change management program in place. The bottom line here is that change management is equal to risk management. - A clear objective and action plan. Without this, you might end up shelving the project. - A team in charge, where each member has clearly defined roles to avoid overlapping tasks and lack of accountability. - A system of communication, which identifies the channels you will use for progress reporting such as project board, meeting, or email. The J-Curve; What is it? 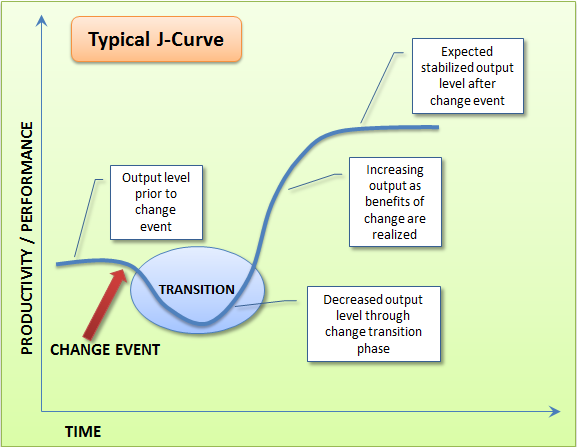 You’ll also need to communicate the concept of the J-curve, where people tend to get stuck in a sort of a hole and become incapable of moving forward because they were not prepared or trained to manage change. Be ready to communicate to your team what the change is, what to expect from it, how to go about it, and possible issues that might arise. Then, test the new system, allow people to explore it, and learn it before launching it in a live environment. It’s quite tempting when you hear that there’s a new job board, software, app, or tool in the market and so, you’re quick to jump in. The problem, in this case, is that you’re spending more and getting less because you might be buying on impulse, not for the need. Here’s what you should do: make an inventory of all the tools you have and gauge their usefulness. If you feel you’re just adding a new tool but are not sure how to use it strategically, then hold it off. Think about it: do you really need new stuff, or do you just need to enhance your current processes or systems? At the end of the day, you need to critically assess what’s keeping you from hitting your recruitment goals and decide how you can get past through it. Trying to unlearn something that you’re used to doing all this time may make you feel reluctant. The one question to help you is: if you stopped doing this or that thing, would it cost you something? If not, then go ahead with those “stops” and come back wiser in 2017.